Can anyone do that?? I certainly can't. I hit the limit of my own strength today. This is how far I can go. Too bad that I still have a giant paper to write, an online course I haven't touched in a month, sink full of dishes, suitcases left to unpack, you get the idea. Does the person above exist? I kind of feel like moms have some of those super human abilities. But really, I can't even make my own schedule work in my own strength. So rather than trying to catch up to Jesus who feels like a million miles ahead of me, I'm going to try just to walk with him for the day. Maybe I'll get a bit further. Maybe I will feel fulfilled rather than exhausted. Rejoice rather than wallow. And maybe even catch 30 minutes of Biggest Loser. I did have a moment to read through today's entry in My Utmost for His Highest that I highly (ha) recommend. It convicted me to the degree that I've taken a break from writing a paper to write about this to you and to myself. ..."We run ahead of Him in a thousand and one activities, consequently we get so burdened with persons and with difficulties that we do not worship God, we do not intercede. If once the burden and the pressure come upon us and we are not in the worshipping attitude, it will produce not only hardness toward God but despair in our own souls." Whew. No wonder I was crying last night over my Interpreting the New Testament paper. Come on, Megs. And I encourage you, too, to come with me back into a posture of worship that we might be able to surrender to God our burdens and pressures. I hope this song helps lead you into God's presence now. I know I haven't been posting, but it's primarily because my blogging energy goes into the posts I've been doing for the school's blog. 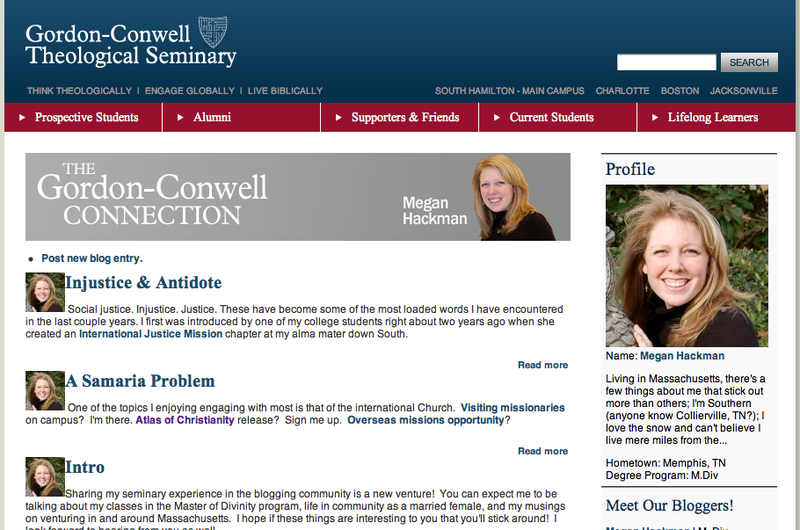 If you're interested in my school-related musings, you should check it out!